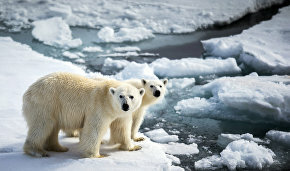 International Polar Bear Day is observed at the end of winter every year. The polar bear is a dangerous predator, the hero of a Soviet cradle song and simply a charming animal. The polar bear cub Umka, who set off on a long journey to find his friend, has become a favorite hero for several generations of children. Arctic.ru offers readers the chance to learn more about this wonderful, strong animal through a legendary cartoon. 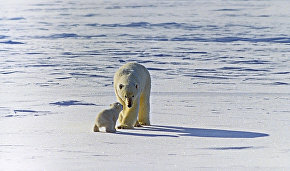 In the very beginning the bear mother teaches Umka ("umka" means polar bear in the Chukchi language) to build a den: "You should dig a hole with your claws and lie down there comfortably. When you are covered with thick snow, start tossing and turning, Then stand up, straighten your spine and raise the ceiling." Some dens are fairly large because polar bears may be three meters tall. Interestingly, not all polar bears enter hibernation like their brown brothers and sisters. Pregnant or nursing bears usually go to dens in November and spend about three months there. Pregnant bears put on extra weight that may reach 200 kg to survive hibernation without a problem. Bear cubs are born blind and weigh about 600 g. Other adult bears continue hunting in winter. Young mothers and their cubs try to keep a distance from their fathers who often eat them in search for food. In the cartoon, the bear mother asks Umka to catch some fish. In reality polar bears are not the best fishermen. They prefer to eat dead seals, especially their fat. In winter polar bears expend a lot of energy on warming up their bodies, so they prefer not to waste more of it on digestion and banquet on seal fat. When hunting is difficult, polar bears may eat plants, although their caloric value is not high enough for them. Apart from seals, polar bears eat floe rats, square flippers and dead walruses, whales, deer and polar foxes. They can smell their prey at a distance of 1.6 km on the ground or under one-meter-thick ice. Further on the mother bear tells Umka about people. "They smell of smoke," she says. 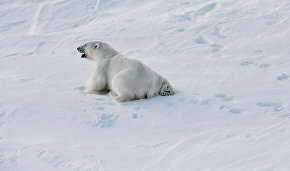 Polar bears often approach the housing of people in the hope to find food or just out of curiosity. Thus, in October 2015, three adult bears swam to a Canadian vessel that was conducting climatic research in the Beaufort Sea. One bear saw a black cable go underwater and tried to taste it. Researchers yelled at the bears to scare them off. Employees of Arctic stations usually take signal flare pistols when going outside to drive them away without harm. They drive quads and snowmobiles to deter polar bears from settlements. If it is impossible to avoid meeting a polar bear, specialists advise to keep calm and refrain from abrupt movements and loud talk. They also suggest raising a stick or some other object either straight or at a 45-degree angle. This seems fairly easy but it would be best not to test the efficiency of these methods in practice. Thus, last December, Chukotka residents faced the invasion of 71 hungry polar bears. Apparently, they were attracted by the smell of whale and walrus corpses and fishery waste on the coast. Experts managed to scare away all polar bears and no damage was done. In the cartoon, Umka befriended a boy but in real life polar bears eat people if they are hungry. 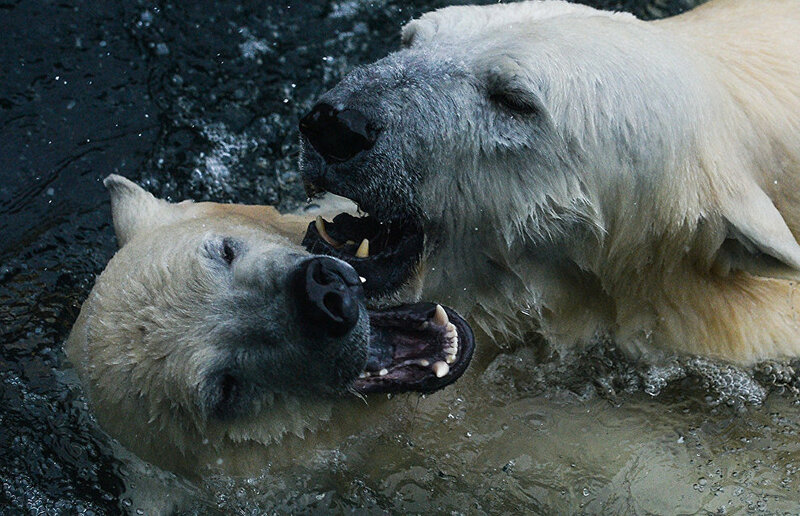 Japanese photographer Michio Hoshino was attacked by a polar bear. During an expedition in Alaska he narrowly escaped, driving away in his car. Regrettably, he was killed by a brown bear on Kamchatka. In 2012 a polar bear literally terrorized the Valkarai polar meteorological observatory on Chukotka. He first killed and ate one of the dogs that tried to scare him off. The station's employees also tried to drive the bear away but as a result two men were driven to the station's roof where they sat for a whole day. The bear did not respond to loud sounds or torch fire. Eventually the police came to the site and tried to scare of the bear but he kept returning to the station and it was decided to kill him. A National Geographic photographer depicted the friendship between a husky and a polar bear in Canada. On the photo they hug and bite each other jokingly. The question is whether or not the dog realized that this game could end any second. Let's get back to the cartoon. Umka invited the boy to swim in the sea, saying it wasn't cold. Polar bears have a layer of fat under their skin — it is impermeable and doesn't get heavier. The layer of fat also keeps them warm. Their fur has a yellow tinge and sometimes becomes greenish in captivity, while their skin is black. Polar bears have webbing between their toes to help them paddle. They are good swimmers. They can swim at 4-5 km per hour and run at a speed of up to 10 km per hour. The legendary swimmer Michael Phelps' record speed was 6 km per hour. At the end of the cartoon, Umka and his mother go on a voyage. "We are sailing on a floe as if on a brigantine," Aida Vedishcheva sings. At one time a she-bear covered 687 km in nine days without a break. Researchers tracked her movements in the water owing to a GPS collar. Arctic.ru reminds everyone that it is illegal to purchase or sell polar bear skin. The price of a bear's skin can reach 1.5 million rubles on the black market and many people try to make money this way. Hunting polar bears is banned almost in all Arctic countries. In Russia only indigenous minorities have quotas for hunting polar bears.